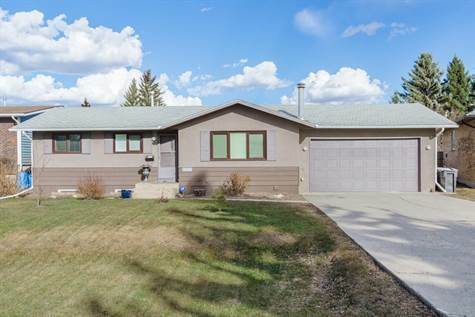 Welcome to 1626 Bader Crescent, a 995 sq/ft three plus two bedroom bungalow situated on a gigantic 15,703 sq/ft lot in the desirable Montgomery Place neighbourhood. The massive backyard has lane access and no rear neighbours with lots of room for RV parking and lawn/garden space. Enjoy our amazing Saskatoon summers puttering around the landscaped yard that includes gorgeous perennials and a large fire pit, which is perfect to sit around with friends and family once the sun goes down. Inside, you’ll find three bedrooms, the living room and the kitchen and dining room. Garden doors to the deck off the dining room provides you with outdoor dining space. The partially finished basement has a wood burning fireplace, two bedrooms, a four piece bathroom, and a roughed-in kitchen, which could make the basement into a non-conforming suite. The home has some recent upgrades including a new water heater in 2014, triple pane windows and newer deck. The double attached garage measures in at 20x40 and can accommodate numerous vehicles and/or toys! This home is perfect for families that enjoy DIY projects, the outdoors, and where it feels like you're living the lake! Come check it out today!